Our adventure began as we headed towards Hocking Hills in Ohio. 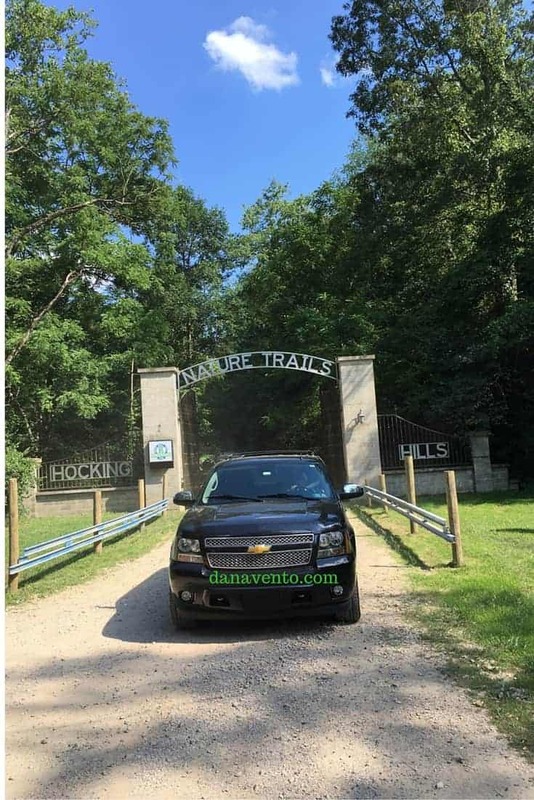 I have to tell you I had no idea we would be without cell service and without a GPS system, as we really were off the grid for this adventure in the Hocking Hills area. This may well have been one of the best vacations we have been on because I had absolutely no phone service and it freed me up from everyday life. We headed to R Adventure Park where we were the first clients of the day and the last to leave. My boys love paintball, one plays on a Pro team and the other just goes to play. None of us have ever ridden ATV’s before, but I have ridden snowmobiles, so I am excited to get to try out riding an ATV. 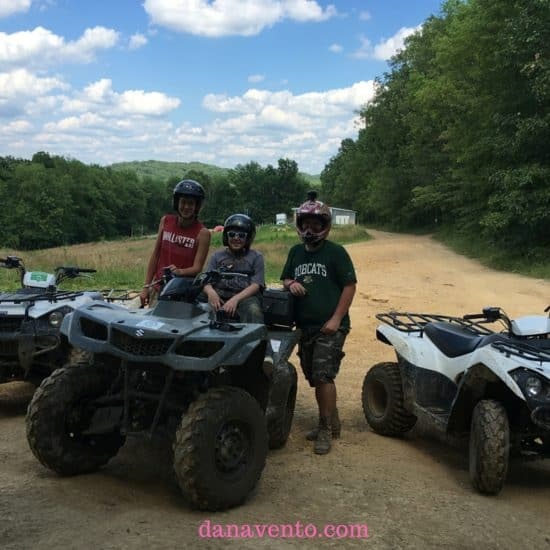 Lavishly live travel out loud and join us as I share a premiere destination for paintballing and ATV fun in Hocking Hills, Ohio. Our day was provided compliments of R Adventure Park. Images and content are based on OUR experience. 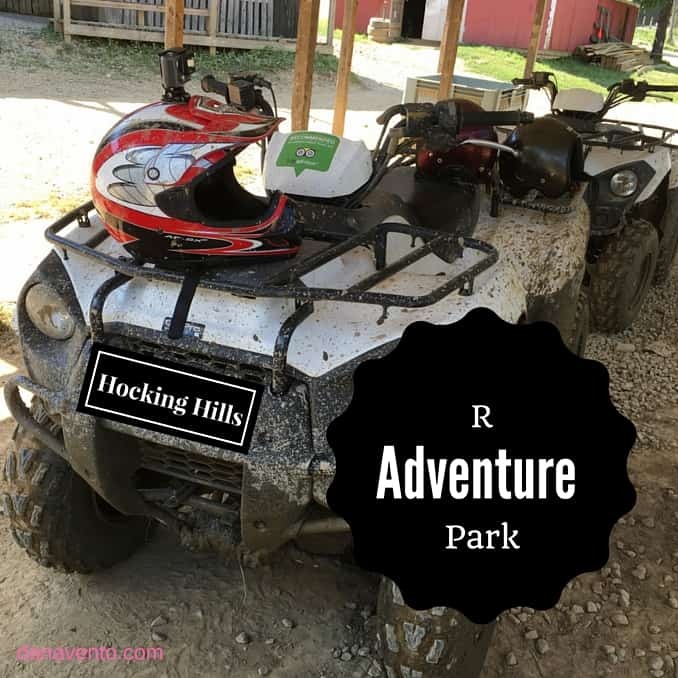 Hocking Hills paintballing and ATV fun are in one location so you only have to head to one place for a day filled with fun. 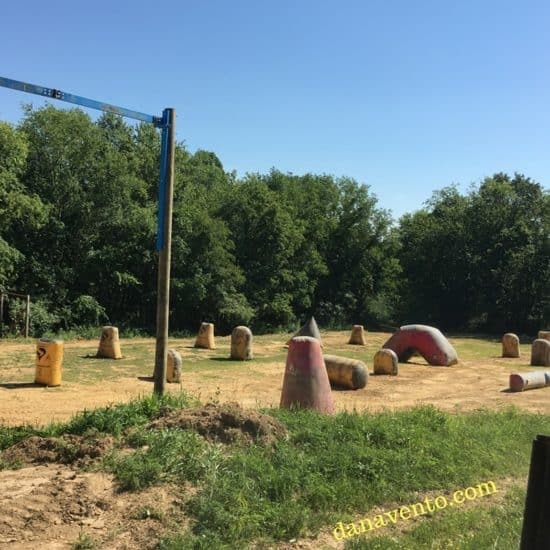 It is time to lavishly live outdoor adventures out loud riding ATV’s, playing speedball and wood ball at a Premiere Destination For Paintballing & ATV Fun In Hocking Hills. Wear jeans, boots, a tee shirt and definitely slap on deet, you are about to go into the wild, lol. Well, you will be in the woods for a while and those clothes will protect you from the elements and the mud! Yee-haw. You know you found the right destination R Adventure Park when you see this driveway and these gates. 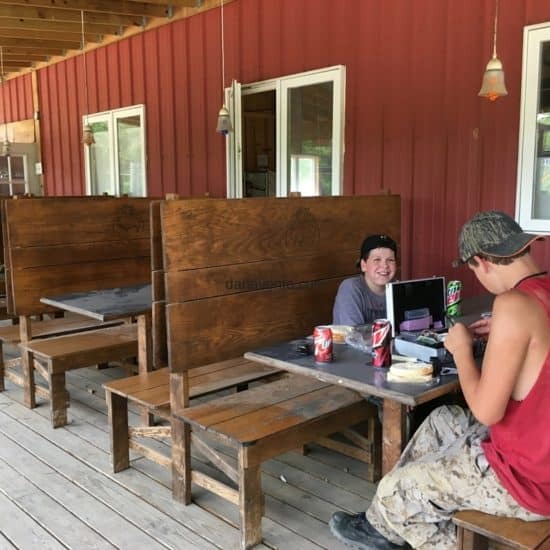 Get ready for fun and adventure in paintballing and riding rental ATV’s, though you can bring your own and ride the trails here as well. At the top of the hill is where we are going to get geared up for Speed Ball. Check out the office up here. We were on this for just like 5 minutes, because the hill is steep. If you prefer to walk up you can but just know it is a hike with equipment. Also note that unless you bring beverages and eats up here, you will have nothing with you. I totally suggest bringing beverages because after a few rounds of Paintball and running around I was DYING of thirst. We met up with our guides for paintball in those that were going to play against or with us as well. This is where we met both Sean (far left) and Tyler (far right). We were about to have a really great day. You better believe I too suited up to play, as I was not going to be outdone by Where MJ Travels and Where Niko Travels. I have skills beyond recipe preparation and I learned that I was stealth in the woods. No one could find me! Ha, the blessing of being petite! I am glad that the Hillbilly brought us up that steep hill and we did not have to walk, it was a really warm day. However, I will again suggest I should have thought to really bring a cooler of beverages because there is nothing up here yet. 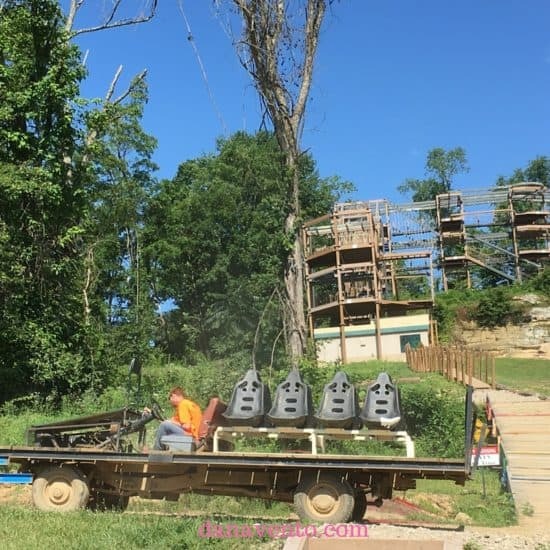 The owner is still creating the park. It is really nice here but not all developed. Here is where you get your gear if you need to rent it. They will get you the guns, goggles, ammo etc, and there is plenty to choose from. If you do not know much about the sport, they will quickly school you. It’s easy and it is fun trust me! 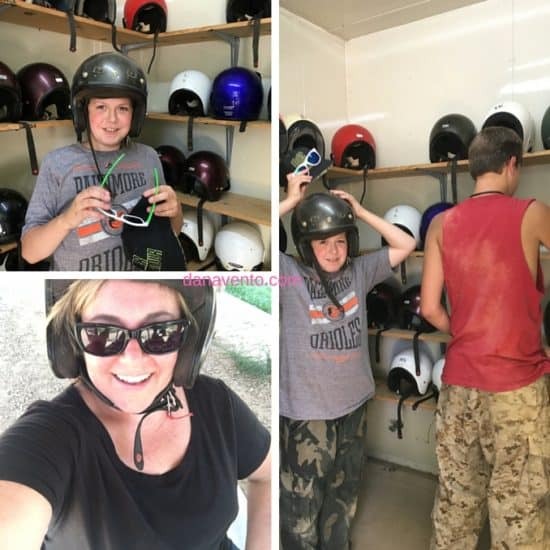 Sean and Tyler are pretty much pros it playing paintball and ATVs and we would soon come to learn all we needed to know about this awesome adventure we were taking today. The course you see here is fast and easy to play. However, if you plan out your attack you may just win. I beat Where MJ Travels through one round then got beaten and nailed with paint the other round. Oh, my do those paintballs sting. Welts are what I was left with, but we continued on into the woods. Where not only would I not surrender, but I got poison ivy! Hoorah! Our results of the speedball games: I nailed my son and his armpit with paintball and then, of course, he nailed me back in the leg and let me tell you for the record those little paintballs do sting through jeans! We played about 4 rounds of speedball and headed into the woods to play Capture the Flag and after I hung out in the ravine marking any unlucky passer-by playing, I finally could not take the mask or outwear my son, so I gave it up. They all continued until he and Sean had the final battle. We took a little break in between speedball, and Woods-ball and dined on a lunch that we had packed. You can buy beverages on the premises in a machine and we did that because we wanted something really cold. I am happy that I packed some food because that was not an option. So plan ahead with a cooler and bring your meals. You will at least need a snack if you are going from sport to sport and that is what We did. Then it was time to meet the ATVs that would provide the thrill of a lifetime. 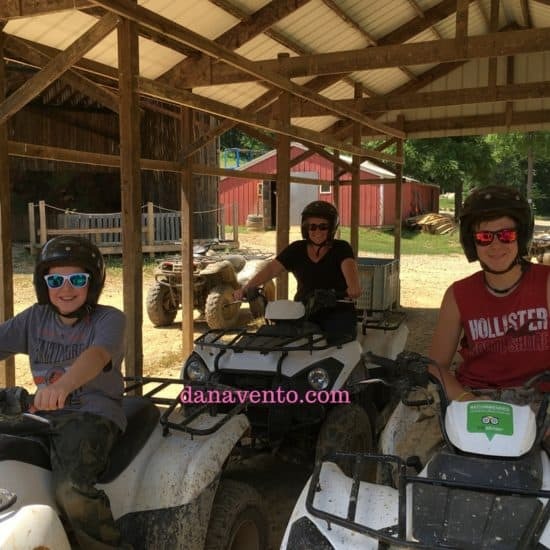 We got ready to board ATV Rentals and what you need to know, is the only place in OHIO that you can rent ATV’s is here. 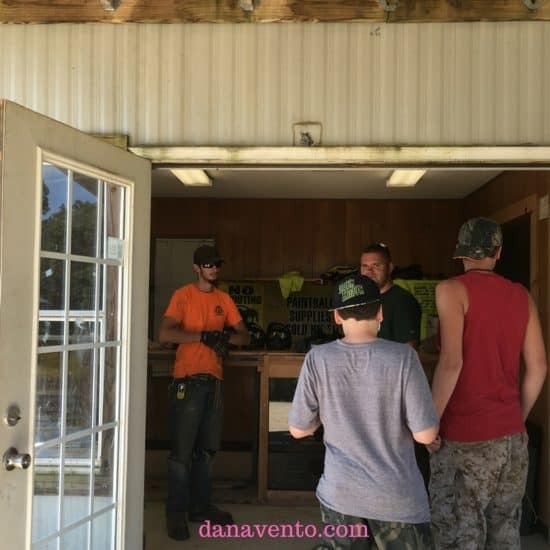 Tip: Call ahead to schedule your paintball or ATV riding time because they are VERY busy and you don’t want to miss an opportunity like this. Also, ask for a guide to head out with you, we grabbed Tyler from paintball and he was awesome. First, we took a trip to the helmet house and we got matched up with helmets to fit each of our heads. The booth we are in is not only bullet-proof but soundproof, it is a toll booth that the owner bought to house these, it is cool! I felt like the President getting inside of this safe from everything, lol! 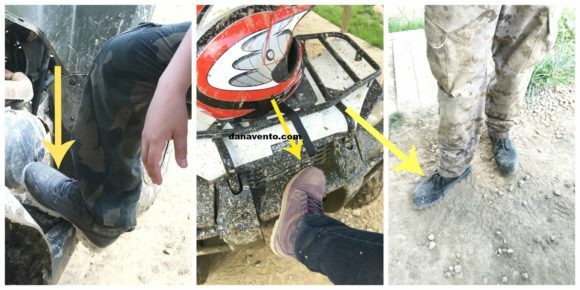 Tip: I personally advise wearing jeans and closed toe shoes: either boots or tennis shoes whenever you are you riding the quad. The heat of the engine against your leg does get warm and if exposed it could get very uncomfortable. Boots are great. If you have to get off the quad for any reason you might be stepping into some serious mess like mud or other crappy debris. Plan this ahead. I want to thank LUGZ for the comfortable, traction boots. We wore, Black Empire HI WR bots, Charcoal/White Scavenger Ballistics, and mine were Mulberry Regiment Hi WR. All the boots were perfect and the FlexiFoam made them super comfy. We wore these boots all day-long. These boots are water resistant and made for this type of adventure day. We started out on the training trail and rode over bridges and platforms. Then we went through the course to make sure that each of us could handle our quads. Here Tyler advised us how to make a good run and how to take corners. Once we pass through the course and felt comfortable on our quads it was time to really punch it! We took off for the trails. Honestly, the hardest part for me was the tight turns of sometimes the trails had a big chunk in the middle. I did not want to catch my tire in it or mismanage. But, that said I did fine! We went up steep hills and we descended down very steep pitched hills as well. Then we traveled through mud, dirt and ridges in the road sometimes he went slower and sometimes we went fast. Last, we traveled through a covered bridge, on paths in all over 88 acres. It’s easy to do you have a great guide like Tyler and if you follow the signs that code which trails are easy and intermediate or black diamond so much like skiing. We stopped along the way because we saw fawns feeding. Additionally, we saw a turtle on the trail and nobody wanted to crush it! That is just some of the wildlife we saw. You can bring a lunch and eat on the back patio that overlooks the quad rental facility. Also, the bathrooms are housed by the main office and you can change there. Don’t expect them to be elaborate, they are kind of ‘eh’ but at least it is an option. There are other attractions there but these are where we spent the majority of our time. It is advisable to take a change of clothes because chances are you will get very dirty. Prepare for limited phone service in the Hocking Hills area so don’t plan on using your phone but you could utilize it take great pictures. Do you bring along a go pro or something of the like. Capture amazing footage while you’re riding. All of the employees will go out of their way to make sure that you have a great time. Feel free to just ask questions if you are curious about an attraction. 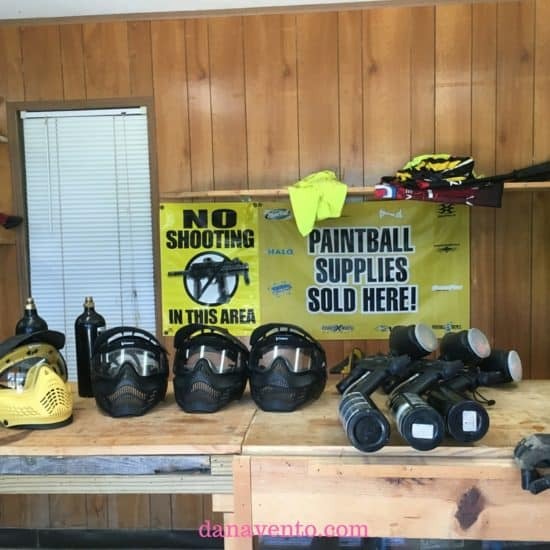 For paintball, you will find fully stocked guns. Additionally, there are ammo packages that are reasonable. Don’t worry about bringing yours along they have them there to rent. In addition, they had a disposable coveralls for paintball as well. If you do bring your own gear, they ride it up for you on their homemade HillBilly. You can ride on this too as I discussed. Lavishly live travel out loud and get ready to have a blast outside playing and forgetting about the world of technology as you disappear into the woods of Hocking Hills, Ohio. 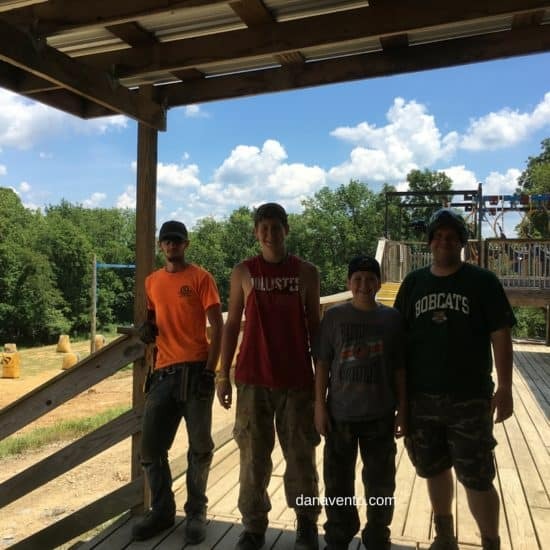 Now you know the Premiere Destination For Paintballing and ATV Fun In Hocking Hills. This is some really good information about ATV’s. It is good to know that you should wear a good helmet. My parents are planning on getting a few ATV’s this summer. So, were should make sure that a bunch of different helmets as well. After reading the article I can guess how cool it was and Nw I also want to ride an ATV! This looks awesome. Hello, Dana! Thank you for this detailed vacation review in Hocking Hills. You described everything so precisely that I don’t even have any questions. My family and I plan to go there on vacation next spring. I already promised my kids we’ll ride ATV or UTV. Looks cool, btw thanks for the sharing. It looks like a great experience and so fun. I have never tried soemthing like this and would love to try out the paintball too! Paintball is so much fun. It’s one of my favorite sports. Hocking Hills paintballing is really enjoyable. I also like it. 4 is a great number of people to play paintball game. You guys must have had great experiences after this trip. Sounds like a wonderful & unique experience to cherish. The pictures are quiet interesting enough that I would love one such trip anytime with my husband & kids! Sounds like a fun day! My husband would like to do this for a date! I super love your adventure! I want to try this, riding with ATV sounds really fun. What a fun and adventurous way to spend time. I would like to try that ATV ride. for sure my kids will enjoy a day here. That looks like a place to unleash the inner tomboy in yourself. I am not a big fan of ATVs but my daughter loves them. She would really enjoy that part of the park. I don’t know about the paintball part. I would have to ask her. Oh my gosh, I have always, ALWAYS wanted to ride an ATV! This looks like so much fun. Just looking at the smile on your boys faces … YES! Glad you all had a blast. Good times in Hocking Hills! It looks like you enjoyed your day so much! And that’s awesome! It’s definitely action packed! When it comes to boys who are very active, you can’t really go wrong with a place such as this! ATV plus Paintball in one place, there’s nothing more perfect than that! Glad you all had a great time! Carol Cassara recently posted..Too many tomatoes? Looks like the boys had a lot of fun during their R Adventure experience! I think this is perfect for spending some quality time with them too. I’m sure it was all worth it! I am not much of a paintballer, but I would have loved that ATV ride! I used to ride ATVs all the time at the farm when I was younger! This sounds like a completely fun and active time to spend with the family. I’m always thinking about whether I’ll get cell service when I go out of town or to a remote place. I bet you didn’t miss it one bit though because I never mind it either! Oh, I want to ride an ATV! This looks like a really great experienced! That is so cool! I want to try it someday.